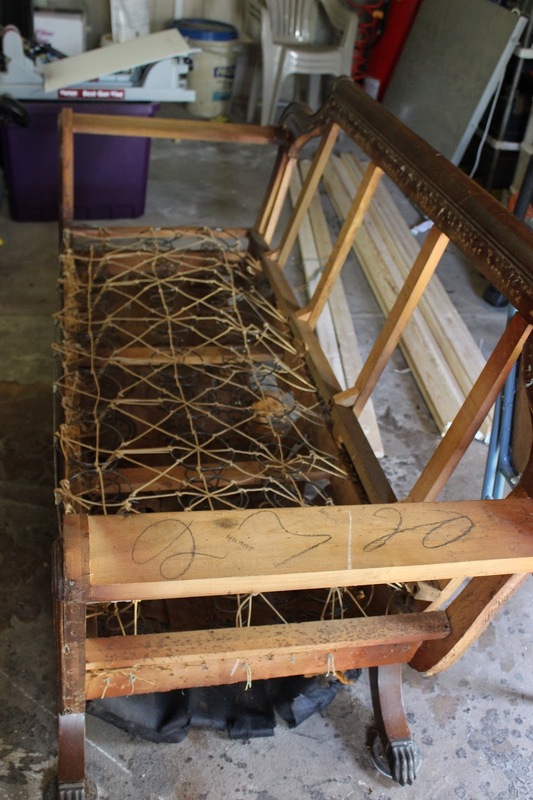 After a few days of some serious avoidance, I felt like I was ready to get a start on gutting my new sofa. I came armed with a notepad, camera, and a mental resolve to face something I knew would be pretty gross. With the shop fan on full blast, trying to decide which was more disgusting--breathing through my mouth or my nose-- I started to examine the couch. I learned from doing the wingback chair that you have to be systematic--taking things apart in the reverse order of how they were put on, making note of the order for when it comes time to put the fabric back on. It also helps to take pictures of tricky bits that are easy to forget. Thus prepared, I started peeling off crusty yellowed gimp cord, only to reveal hundreds and hundreds of tiny nails. NAILS. Not staples, which come off fairly easily, but flat-headed, flush-with-the-wood nails. Ugh. 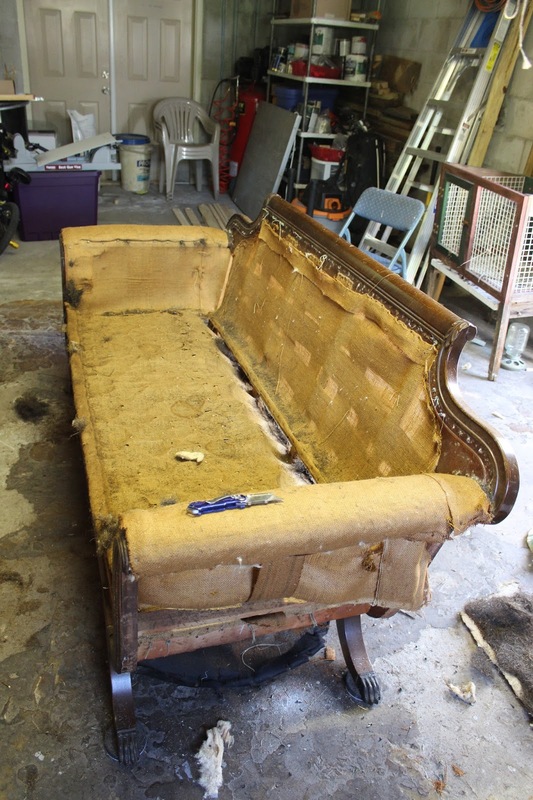 As if digging a bazillion nails out of old, smelly wood wasn't bad enough, I discovered that the couch was stuffed old-school style with some kind of weird fiber over the cotton batting that, when tugged upon, exploded into a mist of ancient pee-soaked dust to be immediately absorbed by my nose. It took me a good three hours of nail pulling, ripping, yelling, gagging, and holding stiffened yellow brocade as far away from my body as possible to get it (mostly) gutted. I left the bottom layer of webbing with the springs attached for two reasons: I wanted to keep the springs together until I'm ready to re-tie them, and I was just tired. 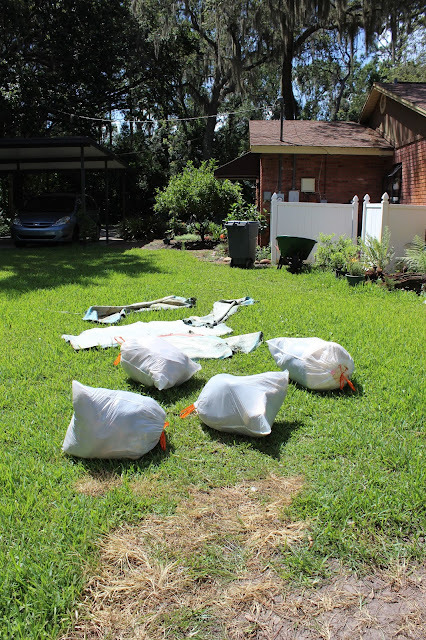 I bagged up all the junk, vacuumed up all the nails (expect the baker's dozen I had stuck in my flip-flops jamming into my feet), and called it a day. Next step: refinishing the wood, and replacing one crossbeam that is likely ruined by the pee. 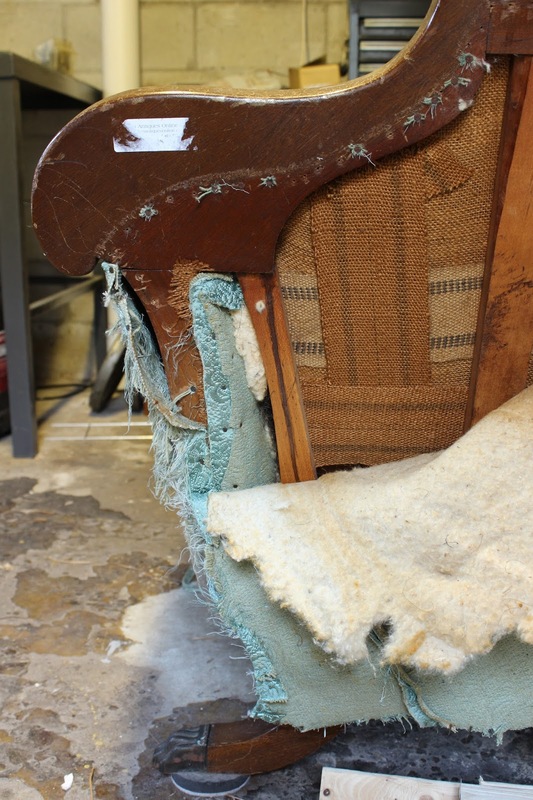 At many points during the gutting process did I begin to question the mental soundness of taking on this project. All I can say is, it better turn out good. I'm sure it will be gorgeous. Can't wait to see the finished result! It will be worth it. But boak!!!! That sounds all kinds of nasty. All of this hard work now will only make the end result all the more satisfying ;O) Go, Jenn! Go! Gonna guess maybe it was horsehair. I bet it turns out beautiful. wow! I would have gotten to the flat nails and said, "ok I'm done!" way to stay committed!